When the Warm Weather Breaks you'll need this Vinci white suit for men with flat front style pants. Fabric is super 150s Poly/Rayon. Pants are no pleat style and lined to the knee. 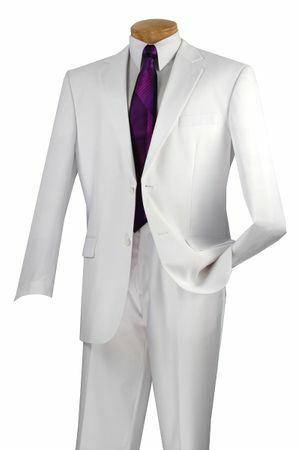 This classy looking White suit for men is great for that casual but sophisticated look for the warm weather. You will make your tropical style come alive and really enjoy your vacation wearing this white suit for men because as we all know, if you look your best, chances are more than likely that you will feel your best and that will always boost your confidence. Wearing a white suit for men can help your confidence really soar when the temperature moves in the same direction.